Oil futures prices may be rising and almost kissing $70 per barrel, a significant rise since the January $46 lows, but it is no time for celebration yet for cash strapped oil exporters like Nigeria and Angola. Analysts and traders warn that there is still a palpable glut in the physical crude market, different from the illusion of “strong demand” in the futures market. Reuters reported Wednesday that tens of millions of barrels are struggling to find buyers in Europe as data from the Organisation of Petroleum Exporting Countries (OPEC) and the International Energy Agency (IEA) show the world is still pumping 1.5 million barrels per day more crude than it consumes. Worst hit are oil traders of West Africa, Azeri and North Sea crude. Traders said around 80 million barrels of Nigerian and Angolan crude oil are on the market with at least a dozen May-loading cargoes still available. “Near term oil market fundamentals continue to look dire, particularly in the Atlantic Basin, with Nigerian, Mediterranean and North Sea differentials all weak,” analysts from London-based Energy Aspect consultancy said Wednesday. Similarly, traders in Azeri Light crude, usually one of Europe’s favourite grades due to its high quality, said some 10 cargoes from the May tanker loading programme are struggling to find buyers, just two days before June volumes are due to go into the market. As a result, the Azeri price premium to benchmark dated Brent is the weakest since December, when it hit a five-year low. In the North Sea, Norwegian Ekofisk crude fell to its weakest since August last year due to a significant number of unsold May cargoes, despite June programme already trading. The deep disconnect between the oil futures and physical markets looks similar to the events of June 2014 when the physical market weakness became a precursor for a futures price crash. “Being large physical buyers of crude, we have a direct pulse of the market and feel immediately when it is well supplied, as is happening now,” Dario Scaffardi, executive vice-president and general manager of independent Italian refiner Saras, told Reuters. Benchmark Brent oil futures prices more than halved between June 2014 and January 2015 after OPEC refused to cut output and instead chose to undercut more expensive producers, including a booming US shale oil sector. 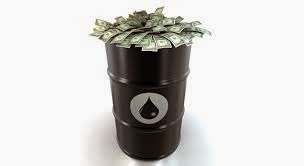 But since January’s lows of $46 per barrel, prices have risen back to $69 per barrel Wednesday on fears the output in the United States would fall deeper than expected and on signs of a faster-than-expected demand rise across the world. There is no guarantee oil futures will definitely follow the physical market as they did after June 2014. A number of unknowns could take oil prices either way. A failure to reach a nuclear deal between Iran and the West in June will reduce the likelihood of increased supplies from the Islamic republic and therefore give prices some support. The ex-boss of BP, Tony Hayward, said last month the withdrawal of capital and workforce from the US shale oil industry was so steep that a new oil price bull market might come much quicker than expected. Others argue that shale producers have become much more efficient in recent months and can switch production back on as soon as prices reach $70 per barrel. The head of oil trading house Vitol, the world’s largest, Ian Taylor, said he saw another dip in oil prices soon. On the demand side, the biggest unknown is whether China will resume buying large volumes of oil for its strategic reserve in the second half of the year. However, an increasing number of market watchers agree that the fundamentals point to what should be a more bearish market, at least until either supply is cut or demand increases. “We cannot help but compare the current price strength to the myth of Sisyphus,” said Tamas Varga from PVM oil brokerage. “The top of the current bull mountain might not be close but unless there is a fundamental change in the physical supply/demand balance, the rock might start rolling back down shortly again just like it did in the second half of 2008 and 2014 only for the bulls to start the arduous uphill battle all over again”. However, as Nigeria continues to struggle to find new markets for her crude oil, experts in global oil and gas sector yesterday reiterated that the best long-term option available to the country is to diversify the economy and pay more attention to developing Nigeria’s gas resources. Speaking at the 2015 Offshore Technology Conference (OTC) in Houston, Texas, members of the Petroleum Technology Association of Nigeria (PETAN) said Nigeria with its huge gas deposits should not sit idle lamenting over the drop in crude oil prices, as it has abundant gas resources to serve as a buffer. Specifically, the Group Executive Director, Gas and Power of the Nigerian National Petroleum Corporation (NNPC), Dr. David Ige, who spoke on behalf of the corporation’s Group Managing Director, Joseph Dahwa, said that rather than taking the position of a victim, Nigeria should see an opportunity in the current development to push for greater stakes in her gas production. Ige stated that with gas at the top of Nigeria’s priorities in the global hydrocarbon industry, the country could in addition to making annual savings of $20 billion from gas-driven import substitution, drive her industries to profitably produce goods that are currently imported into the country and thus achieve inclusive development. He however explained that for this to happen, the country would need to grow its gas output to about 6 billion cubic feet per day (bcfd). Speaking on "Natural Gas Development in Nigeria: A Compelling Investment Frontier in a Turbulent Oil Market”, Ige stated that whilst the country's gas sector had grown its production from 300 million cubic feet per day (mcfd) to the present capacity of 2bcfd, it would still need further growth to support the country’s industrial revolution and subsequent import substitution. He said the falling price of oil brings to the fore the importance for Nigeria to structurally reposition itself and dedicate more focus on developing a gas-based economy. Ige added that industries such as steel, petrochemicals, cement and textiles, among others, are potential sources for reducing the amount Nigeria spends on importation of goods that are produced locally. “If we project the requirement to support the industries listed above, the sector may need to grow gas further to about 5 to 6bcf per day by 2020,” he said. He equally told the audience that despite an annual investment of over $1 billion per annum in the last four years in gas infrastructure, there is still a need for significant investment in the sector, as more kilometres of gas pipelines still need to be built to connect new markets, while increase in gas processing facilities is also needed. Calling on investors to take advantage of the extant opportunities that the current developments present in Nigeria, Ige said the federal government's policy thrust to support such investments had been laid out, adding that there was no better time than now to invest in Nigeria’s gas sector. Similarly, the Managing Director of Shell Companies in Nigeria, Osagie Okunbor, said that given the recent developments with oil prices, many governments in the Middle East, America and sub-Saharan Africa, are now looking at how to harness their gas potential. Okunbor stated that these countries are putting in place ambitious programmes to attract investors to set up big industrial plants to monetise their gas resources, create jobs, and take advantage of other multiplier effects on their societies. Okunbor said the Nigeria gas master plan remains a key policy document and platform for the country to develop its gas economy in partnership with private sector players. Meanwhile, following what it described as a “series of leaks” in the Trans-Forcados pipeline, Shell has declared force majeure on Forcados crude oil stream, effectively disrupting the export of 189,000bpd. A Shell Nigeria spokesman confirmed to THISDAY Wednesday that the force majeure was declared on Tuesday evening, after leaks were discovered on the pipeline. The Trans-Forcados Pipeline, which is owned and operated by the Nigerian Petroleum Development Company (NPDC), a subsidiary of the NNPC, is the main pipeline that transports crude oil produced by Shell and other third parties in the western Niger Delta to the Forcados export terminal in Delta State. Before the declaration of the force majeure, which frees Shell from contractual obligations to its customers, 189,000bpd of Forcados crude were scheduled for export in six cargoes for May, while 158,000bpd were scheduled for June. The closure of the Trans-Forcados oil pipeline earlier this year due to sabotage led to a drop in power generation by 1,500MW. Though the pipeline is a crude oil facility, gas fields that supply gas to power stations had to be shut down because the liquid condensate they produce in association with gas is normally evacuated through the pipeline. Before the closure, the pipeline was scheduled to export about 260,000bpd in January and 210,000bpd in February. Apart from Shell, Seplat Petroleum Development Company, which is listed in both London and Nigeria; Pan Ocean Corporation; and NPDC transport their crude oil through the pipeline.